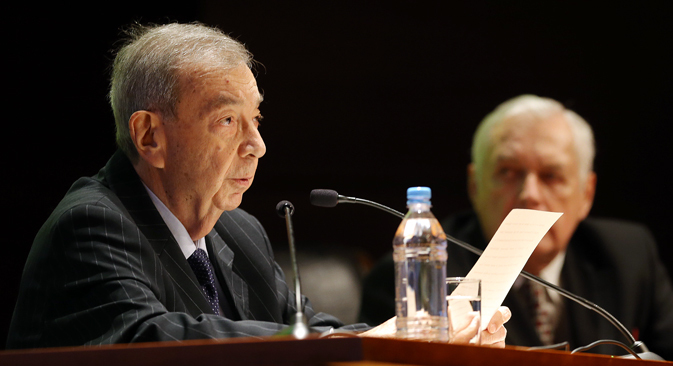 In a speech on Jan. 13, former Russian Prime Minister Yevgeny Primakov spoke about his concerns for Russia’s economic future and said that the country must be open to working with the U.S. and NATO. Russia would like to normalize relations with the U.S. and Europe, but it would be unreasonable to ignore the increasing significance of China and other countries that are part of the Asia-Pacific Economic Cooperation organization (APEC). Certain countries often frighten us by saying that Russia will be only a raw material supplier to China. With all its opportunities, Russia cannot and will not ever be anyone's raw material supplier. Should Russia keep its door open for joint activities with the U.S. and its NATO allies if these activities are aimed at countering real threats to humanity: terrorism, drug trafficking, expansion of conflicts and so on? Without a doubt, yes. Without this [cooperation] we will lose our country’s status as a great power. Not to mention that the Russian people have an interest in eliminating dangerous international situations. Russia is experiencing a difficult economic situation. There are external reasons: the fall in oil prices and the sanctions against Russia. External changes that would favor Russia should not be expected anytime soon. It is doubtful that the sanctions will be cancelled in the near future. Betting on some politicians and European businessmen who speak against the sanctions is not realistic. Russia’s economic course cannot be one of self-isolation. We want to preserve and establish new economic relations with all interested countries and foreign companies. The profitability of extracting oil on the Arctic shelf is guaranteed only at a price of $100-120 a barrel. Should we then, in such conditions, force extractions from the shelf of the Arctic Ocean? Shouldn't Russia, even with all the importance that this region has for the country, take a break from exploring arctic oil and gas deposits? Our competitors have already taken such a break. The U.S. drilled its last well in the Arctic shelf in 2003, and Canada in 2005. Our mass media is wrong to frequently republish material from foreign press predicting a "color revolution" in Russia. I absolutely do not believe that in our internal political context a bunch of opposition figures who do not have mass support among the population is capable of taking power in our country. There has been a tragedy in France. Are there lessons we can take from it? The fact that freedom of the press is necessary for the construction of a democratic society is indisputable. But who says that freedom of the press should be supported if it is aimed at debasing and insulting religious sentiment? Calls to exercise freedom of the press through publishing caricatures, for example, of the Prophet Mohammed offend the sentiments of Muslims. And in Russia, Muslims constitute a significant portion of the population - more than 18 million citizens. Can we still speak of Russia's interest in having the southeast remain a part of Ukraine? My answer is yes; I believe it is necessary. Only on this basis can the Ukrainian crisis be managed. Another question: should renouncing the unification of Crimea and Sevastopol with Russia become a "concession" to the U.S. and its European allies? My answer is no, this should not be a bargaining chip in the negotiations. If the Minsk Agreements are not followed should Russia in an extreme case send its regular troops to help the militias? My answer: categorically no. If this happened, it would be beneficial for the U.S., which would use the situation to keep Europe under its influence for an entire century. Furthermore, this position would not mean that we are refusing to support the militias, who are striving for particular status within the structure of a Ukrainian state.